As a stay-at-home mom to five boys, Lindsay Watts rarely stays at home; her days are filled with school carpool lines and endless errands. On a recent afternoon, as Lindsay and her 5-year-old son headed to pick up their weekly, mid-errand lunch at Chick-fil-A Larkridge in Thornton, Colorado, her car was sideswiped. Thankfully, the only damage was to the car, but this meant their lunchtime would be spent dealing with paperwork and local police instead of chicken sandwiches. A couple miles away, during the restaurant’s lunch rush, Operations Director Terry Sellers noticed a mobile order that sat unclaimed. Following the restaurant’s usual protocol, he called the phone number associated with the order and learned the guest would not be coming to collect her food after being involved in a car accident nearby. As restaurant Team Member Cam Forsyth noticed the kid’s meal in the order and heard Terry hang up the phone, an idea began taking shape. It wasn’t long before Terry, Cam and their coworker Nat Suwantala were re-bagging Lindsay’s order with fresh food, warm cookies and gift cards, along with a special note: “We’re sorry about your car. Hope this makes your day better!” Nat headed out to begin looking for the guest. As Lindsay filled out police reports while her hungry son waited patiently in the car, she was surprised to see a smiling face pull up, get out of the car and begin walking over to her with a Chick-fil-A bag in-hand. When Nat handed her the food, Lindsay was immediately brought to tears. The two embraced, while her son wasted no time digging into his long-overdue meal and the free cookie he had just scored. “I was so touched. I couldn’t believe that they actually cared. No one does this kind of thing anymore,” said Lindsay. It wasn’t until a few days later when a local news station published a familiar story that the restaurant Team Members realized their delivery had not gone unnoticed. “I just felt like I had to share this story with people. The fact that they made me cry and did something they didn’t have to do for someone they didn’t know… I had to tell everyone who would listen,” said Lindsay. While Nat, Terry and Cam are extremely humbled by the attention of their simple gesture, they say it all comes down to wanting to do the right thing. “It’s about going the extra mile for the guests, so if we can make someone’s day better by taking them their food and giving them cookies, then that’s absolutely what we’re going to do,” said Terry. As for Lindsay, she’s already looking forward to her next visit. Chick-fil-A has been named No. 2 on Indeed’s list of Top-Rated Workplaces as ranked by military veterans. The list was published in honor of this upcoming Veterans Day on November 11. 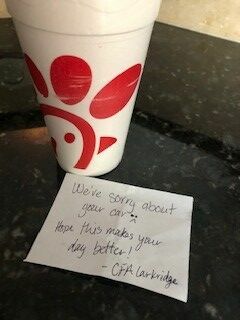 From a friendly, “my pleasure,” to remembering a customer’s name to an occasional extra packet of your favorite sauce, Chick-fil-A restaurant Team Members often find small ways to make sure guests have the best experience possible.